Christmas, like Thanksgiving, is a time for children and the family. Sometimes their memories are sweet as in the Frank Capra film, 'It's a Wonderful Life, ' when Jimmy Stewart's daughter turns to her father explaining 'every time you hear a bell ring, an angel gets his wings.' Other times memories can be sad as with a young Ebenezer Scrooge left in the holidays at an English boarding school to watch the falling snow fill an empty window ledge as his eyes fill with tears. 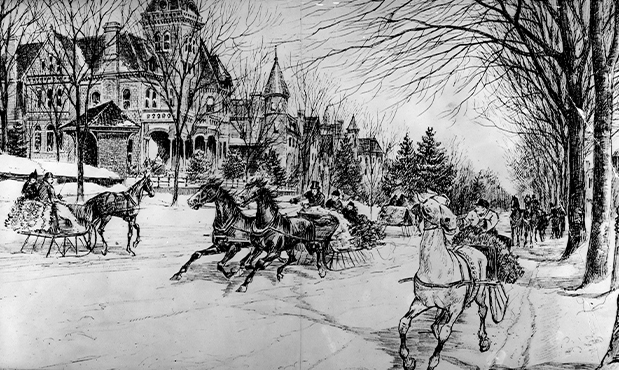 Today our Christmas tale belongs most definitely to that first category, given to us by Charles E. Selvage, former Newark and Essex Fells resident, now of New York City. It is a detailed description of Christmas in one of Newark's great High Street mansions around 1925. Our chronicler was born in the old Homeopathic Hospital in Littleton Avenue in 1917 to Irving Lester and Helen Augusta Selvage who were descendants of early Newark families. Irving Selvage was head adjuster for one of Newark's major insurance companies before opening his own firm located in the Kinney Building at the Four Corners. By 1926 our author's family had moved to a larger house in the country so that 'the children could have more room to play in the nearby woods' and in the innocence of childhood exploration to visit many of Essex Fells' great homes while they were still under construction in early evening and on the weekends. Our story today centers not on the suburbs but on a Christmas the family spent with their grandparents, Mr. and Mrs. Coe at 698 High Street, and all that went on within the walls there. ''Christmas morning! The highlight of the year for all us kids. And what happy memories we all have of our lavish, pre-Depression Christmases at our maternal grandparents' home at 698 High St., Newark, N.J. In the morning we all piled into our old Franklin, the car which we affectionately dubbed 'Frankie,' and which was an integral part of the family. It had a V-shaped windshield, was air cooled way before other cars, had upholstery that wore like iron, window shades with ball tassel pulls, but an exterior which weathered to the dull greenish color of old black clothes. Its horn sounded like an old eggbeater and it shimmied alarmingly after crossing a railroad track. We drove the few miles from Osborne Terrace down Clinton Avenue to High Street and 698. The Coe Family Home at 698 High St. Built in 1871, it has 26 rooms and a restored carriage house. Aunt Laura threatened to take shoe polish to it to spiff it up. There, on a double city lot, stood and still stands the comfortable old Victorian house. There was never any trouble parking right in front. Out we'd all tumble, race through the handsome cast iron fence, up the curved flagstone path, past the tall gingko tree to the front steps. (Grandfather Coe liked to have plants with coe in them, Gingko was even bettered by leucojum; leu for Lou, Grandmother, co for Coe, and jum for Jim, Grandfather.) The brass handles of the outer pair of glass doors shone like gold through the constant care of Tommy, the house man. The damp tile floor of the vestibule emitted a never forgotten scent. The inner doors had glass panels curtained by Aunt Laura's beautiful ecru crochet work of grapevine and clusters. We'd burst into the warm red hall past the Swiss bears hat rack with its collection of gentlemen's canes, the Swiss cuckoo clock above, and put on our 'tin lips' to kiss all the female relatives. The hall had three oriental rugs on the floor, and a large photograph of Lincoln Cathedral on the wall. A second hat rack at the foot of the stairs was mirrored and had upturned deer hoofs to hold hats. Great double doors, always open, separated the hall from the library on the right, the parlor on the left, and the dining room straight ahead beyond the stairs and back hall on the right. Behind one of the library doors was a genealogical chart tracing our ancestry to Charlemagne. A large landscape etching hung over the sofa against the buff colored wall. The front wall had built-in bookshelves separated by the window-door to the front 'verandah.' Four round painted medallions on the ceiling represented the four seasons. Grandfather's chair and footstool, where he sat smoking his cigar and working his crossword puzzles was beside the granite fireplace with its inevitable cuspidor. Over the mantel was a great mirror to the ceiling which reflected to infinity the image in the parlor twin mantel mirror directly opposite, a fascinating phenomenon. The parlor was green with a couple of Hudson River landscapes on the wall and a painted oval of roses on the ceiling around the chandelier. The chandelier and a wall bracket were still connected to gas lighting as well as electricity. Aunt Laura's grand piano was at one end of the room and her silent traveling keyboard was at the other end. She had been a serious piano student. A windup Victrola by the bay window played ‘Aunt Shaw's Pet Jug,' ‘In the Clock Store' and ‘Cohen on the Telephone,' three records that I still have. The carpet was of a green flowered pattern, probably put down for Aunt Laura's wedding in 1897. Mother said that a canvas cover was laid over the carpet when they had a dance, and newspapers were used as an underlayer, partly as a slight cushioning and partly as a moth deterrent. But on Christmas morning that flowered green carpet was the field on which Grandfather scattered five hundred bright new copper pennies. I can still see Grandfather grinning from ear to ear while we children scrambled around and under the Jelliff furniture which is now in the Newark Museum. The sofa arms and the unique short elbow rests of the chairs ended in carved female heads. Grandmother made little silk drawstring bags from dress scraps in which to keep our treasure. Then we heard our army chow signal, ‘Come and get your feed, boys,' on the little xylophone-like gong at the dining room doorway, and in we all trooped, usually over twenty of us, to a grand dinner. On the right, after the door to the back stairs, was a great marble topped buffet under a red fish which someone in the family had caught and had had stuffed. Licorice drops and chewing gum were usually in the buffet for our delight. Next came the sliding door to Grandfather's study. We liked to make believe that it was a department store elevator. We'd slide open the door and daringly call out, 'Sixth floor. Ladies' undergarments!' One of the four built-in china closets separated the study door from that to the billiard room. Through its glass we were tantalized to see the billiard table piled high with Christmas gifts for which we had to wait until after dinner. Between two more china closets was the window-door to the back porch, glassed in winter, screened in summer. This window, like that of the front verandah, was raised straight up into the wall, not pushed open. On the porch was the swing settee, the railway station type step-on scales on which guests often were weighed before and after a meal for a prize to the one who gained the most, and the intercom to the chauffeur in the garage. The big oval dining table, which was still in the house a few years ago when I had the thrill of lunching at it, was lighted by an amber colored glass chandelier with glass bead fringe, and always had a flower centerpiece which was too tall for us smaller children to see over. The old silver soup tureen usually held the first course. We young fry were always served last, a long wait for the carved turkey. It came on blue-plate willow ware with divisions like those at a restaurant. We liked to make nests of our mashed potatoes with green pea eggs. The black marble fireplace, with clock and two metal mediaeval knights on the mantel, had a fire screen on which we hung the wishbone to dry and become brittle enough to snap when wishing. In the hall at the top of the stairs were large blanket boxes in which Aunt Laura deposited the flatware silver each night, a lithograph of Alice, the first child who died in infancy, and a set of weights on pulleys to exercise the children's arms. Uncle Jay's room was the first bedroom on the left, with a large engraving of a lion's head over the fireplace, a Yale pennant, and a small art nouveau desk. Next came a bathroom, then our grandparents' bedroom with twin curlicue brass bedsteads. A window opened onto a small balcony on which I once stood to watch a 4th of July parade. The mantelpiece had a garniture of turquoise enameled glass-domed clock and two vases. Beyond the stairs on the third floor was Aunt Laura's bedroom with twin beds. A high chiffonier held a photograph of a Chinese girl whom Aunt Laura had sponsored. She wrote, ‘I have barbed my hair and I hope you will agree.' Aunt Laura's overstuffed desk was the one untidy thing about that neat person. Her closet door had a many compartmented bag for all her shoes. She seemed a regular Imelda Marcos to us. Her marble topped sink had had the drainpipe disconnected for fear of infection from sewer gas. Her husband had died in one of Newark's typhoid epidemics. We liked to sleep in Aunt Laura's room and when we did she would modestly and amazingly dress and undress under her nightgown. We were fascinated by the performance and I still don't see how she did it. A framed group of Mozart, Verdi, Wagner and 'Meddlesome' was next to the guest room door. The master bedroom, which had been ‘Tante's' (Great Aunt Augusta's) became the guest room. It had a speaking tube down to the kitchen for communication with the servants. A large, deep closet had collected all sorts of intriguing oddments like a rouge pot and a box of court plaster for masquerades, and a magic lantern for casting shadows of our cut out paper figures onto a sheet. A picture of three fashionably hatted ladies entitled 'The Gossips' was over the mantelpiece. I was greatly disillusioned when I discovered that it was only a print and not a painting. All of the bedrooms had slatted doors for summer ventilation as well as solid ones, and when we slept in Aunt Laura's room we would be wakened and startled by Grandfather's sneezes. The rear bathroom had a tub with an upright frame with four or six outlets instead of a shower. A frosted glass door of cranes and bulrushes opened to the large sewing room over the billiard room. There was a bureau with a folding bed in its back, a great novelty. A cabinet with many small drawers contained a rainbow of colored spools of thread, buttons, snaps, tape, etc. A closet held some of Grandmother's old dresses. The silk of some had cracked with age. A print of Landseer's familiar ‘Monarch of the Glen' was on the wall. On the third floor there was a large ‘tower' playroom which must once have been a noisy center of activity. A small storage room had many drawers for linens. Two bedrooms for the younger girls and boys, Aunt Nan and Mother, Uncle Fred and Uncle Roland, were at the front of the house. Mysterious, unvisited servants' rooms were beyond. Down the back porch steps to the spot where Tommy ground the delicious ice cream on Sunday mornings we'd go to the back lawn. On the left was a high board fence with 'Silver Moon' and 'Dr. van Fleet' climbing roses. In the center of the lawn was a three tiered iron fountain in which Aunt Laura planted portulaca after the water was disconnected. One went through a rose arch to the vegetable garden beyond. A many holed martin birdhouse on a high pole was preempted by noisy sparrows. The long row of pigeon and chicken houses on the left once held a number of separate fancy breeds Grandfather eventually let them all run together in the large netted yard to which he carried the scraps from the dinner table. How excited they all flew about when he called 'Here Kippee, Kippee, Kippee!' Narrow steep steps led down to the carriage house, which became the garage and chauffeur's family quarters. One Christmas Hugo's children were all lined up bowing and curtsying and Dad gave each one a quarter. We felt underprivileged and left out in spite of the largesse which we had received earlier. A heap of joyous living and many wonderful reunions took place in 698. The memory of happy holidays and Christmases there continues to enrich our lives.—Charles E. Selvage, 1988.